Need a Simple Mood Tracking Diary? TrackMyStack is the best mood tracking app available online for free. Do you frequently feel stressed, sad, anxious, or even unmotivated? CBT or Cognitive behavioral therapy can help you identify negative thinking patterns. Using the TrackMyStack thought mood diary, you may post check-ins which can include information on negative emotions you may be experiencing, analyze flaws in the way you think and change your thoughts accordingly. We help you understand, evaluate and change your thoughts and feelings for the better. Who Needs to track their Mood? Perfect for people with mental disorders such as bipolar disorders or even kids and adults that simply want to see when they are stressed and want to measure it throughout the day. Our platform has a scale from 1 to 10, from NOT HAPPY to EXTREMELY HAPPY to record mood and other measurements. You can also use the notes area to record any other feelings such as how optimistic, sad, grateful your day is going as well. 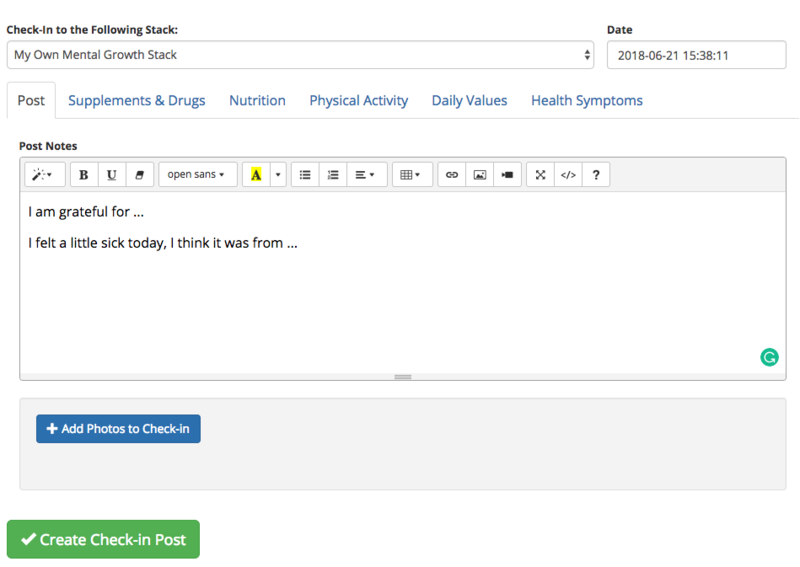 A Health Journal where you can record your mood but also any other symptoms, conditions you may have. 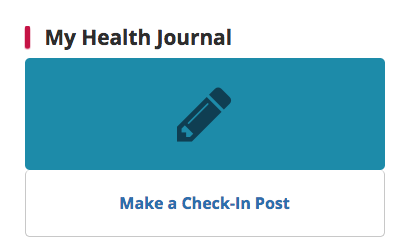 The Health Journal also enables you to record your nutrition & food, exercises, and keep notes with images. We not only let you connect with other users just like you, but we also let you see what others are doing to reach better health outcomes! To get started with your mood journal right away click here. We are always here to help you get better, so if you have any questions or concerns or feature requests, you may contact us. What’s wrong with just using a mood tracking worksheet? Keeping track of your mood via offline methods such as bullet PDFS, forms, journals or printing templates is a thing of the past, firstly, it needs to always be at hand, it is never 100% accurate, it can’t be accessed from everywhere and lastly it cannot provide graphs, charts and dig up statistical significant data from all your logging. Using a spreadsheet software such as excel was the upgrade from a physical mood journal, but excel has limitations in that unless if your main file is stored on the cloud, you would have entries in various areas. 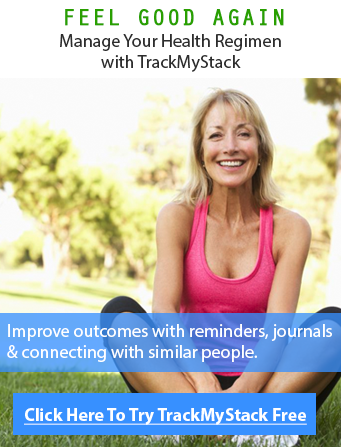 TrackMyStack allows you to have your mood diary on the cloud, password protected or available to the public to give you feedback. It is better to have other’s there to help when needed. What Do I Write In my Mood Diary? With TrackMyStack you can “check-in” with your current mood as many times as you would like, whether it is hourly, daily, monthly or weekly! What happened? Who were you with and where did this happen? What was going through your mind at the time? Can you describe how you felt and or have images? What were you doing before this incident? What did you do after you felt this way? If you feel like you are ready to begin, click here. Do I need a wearable device to track my mood? It is optional, although we don’t suppose integrations with monitors of any kind, this data can be used and inputted manually by you on to TrackMyStack. How do I maintain a mood journal? Create a stack of any medication or supplement you may be taking. If none, you still need to create a stack. Any “Check-in” posts now can be seen as a mood entry. You can leave most fields empty and select your mood from 1-10 at any time of the day, as many times as you would like daily/hourly etc. All For Free. We provide graphs and charts to see how you did that can be organized by different periods. If your stack is public you can optionally get feedback on your posts in your feed or on your stack. Be sure to cheer up others, it can good to be part of someone’s support network. Is it available on iPhone, iPad/iOS, and Android? Not yet but our website is mobile friendly which means after you have created a stack, we advise you to bookmark the “Check-in Post” page, so you can quickly and easily add your mood updates. We are in the process of releasing an app in the coming months that will be as good as some of the other apps out there but with the synergistic medical/supplement/stack component attached to it. You can take a look at other applications such as t2 mood tracker or DBSA wellness tracker till then. What else can you track? Track Symptoms & Conditions: Anxiety, Depression, Aspergers, etc. Other organizations such as DBSA, BBR Foundation (Formerly: NARSAD), ADAA, MHA have their own wellness or tracking software, however, it is not as comprehensive as ours, and above that, some members of these nonprofit organizations have recommended our platform for many members. We continue to work together with other organizations helping people with anxiety and other mental disorders. The main purpose of keeping a mood diary is to gradually change how you feel to situations over time which will help you make lasting changes in the way you think and behave. You may begin for free by creating a stack, then checking-in to your health journal with your mood. If you like the platform you may upgrade to premium for additional options. To get started using the mood tracker, click here.